You know how dazzling the sun can seem when you walk out of a dark movie theater during daylight? Your immediate reaction may be to cover your eyes—a reflexive response based on your brain telling you that it’s too bright for you to be out there. Getting a hearing aid for the first time is kind of like that, too. Your ears have been deprived of sound, so when you suddenly get it back, your brain’s response is to say, “Stop!”. The longer you’ve been living with hearing loss, the more jarring the sudden noise may seem. And people typically do live with hearing loss for several years before deciding to try a hearing aid. In fact, a recent survey of 17,626 Consumer Reports members found that more than 6 in 10 waited for more than 2 years after they first noticed they had difficulty hearing before getting hearing aids. After that much time, the brain has fully adapted to listening through the filter of hearing loss, so it’s not surprising that there is an adjustment period needed to get used to newly amplified sounds. On the positive side, Consumer Report’s survey also found that 3 out of 4 members said it took them less than a month to get used to their hearing aid. Here are some tips for making the transition go more smoothly and when to make a return visit to your audiologist for more help. 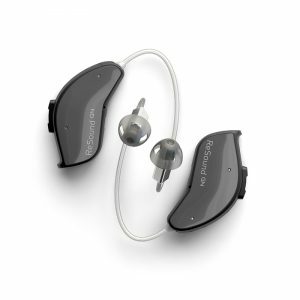 Making sure your hearing aids fit properly in your ears is the first, and most crucial, step toward successful use. Not only does this make aids more comfortable to wear but it also makes them more effective. The fit should be comfortable from the beginning however that doesn’t mean you won’t notice that something’s in your ear (at least for the first few weeks) but it shouldn’t hurt. Before going home, you also need to know how to correctly put the aids in yourself. Even though most aids now come with systems designed to reduce or eliminate feedback, you can still experience the unpleasant screeching or whistling sound if you don’t have the device placed exactly right. It can take some time to get used to hearing sounds that you may not have heard for years. Before you take your aids home, your audiologist will program them (determine the appropriate amplification for you). But if this feels painfully loud, your audiologist can set your device so that it’s lower at first, then gradually increase the volume as your comfort allows. Some hearing aids can actually be programmed to slowly amp up over a period of several weeks until you reach your target goal. When you first start using the aids, know that it’s normal for sounds to seem not only too loud but also too high-pitched. But the only way for your brain to adapt is through consistent exposure. Its best to wear your hearing aids during all your waking hours right from the start, except in situations where they might get wet, such as swimming or showering. But do give your ears a break as you’re adjusting. Don’t head straight to a noisy restaurant or crowded warehouse store. The background noise in places like that can be overwhelming and make it even harder to hear conversations. Normally, you will have an appointment for fine-tuning your device’s settings and fit several weeks after you first get your hearing aid. But if you’re having trouble coping with the volume of sounds (to the point where you can’t leave your aids in for a full day) talk to your audiologist about going in sooner for a refitting. If you find that you are still having trouble understanding words and following conversations, even with your new aids, you may benefit from a kind of hearing aid training called auditory rehabilitation. These short-term online programs help enhance your ability to process sound quickly and improve your listening and communication skills. Some are free, others cost (usually less than $100 but unlikely to be covered by insurance). People with a damaged sensory system need to practice with new sounds after receiving a hearing aid. It’s much like how someone who’s received a prosthetic limb needs physical therapy to relearn how to function. Talk to your audiologist about whether or not you might benefit from this additional training, and if so, which program you might want to try. Most people with hearing loss have sustained damage to their auditory system. So it’s important to understand that an appropriately tuned hearing aid will improve your condition but can’t actually restore your hearing to normal. The goal of the device is to aid you, to amplify sound and make speech easier for you to understand. But you’ll need to do your part and recognize that even with the hearing aid, you still may need to ask people to talk more slowly and look at you when they speak.